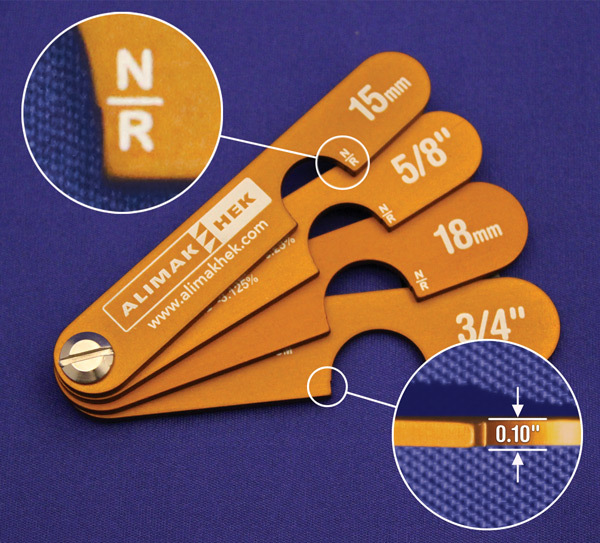 Alimak Hek, a leading provider of vertical access equipment, needed a custom gauge for elevator wire rope and sheave inspections that included only a select range of sizes. We offered them two options a stylized star gauge (below) and a custom set of a modified version of our stock wire rope and sheave gauges in anodized aluminum (right). They chose the later. They were manufactured in 0.10" (2.54mm) Aluminum which is double the thickness of our stock gauges to increase the accuracy of the wire measurement. The GO-NO/GO wire gauge was manufactured to the ASME A17.6-2010 standard where Normal wear is nominal minus 6.25% and Rouged wear is nominal minus 3.125%. The completed gauge set is durable, accurate and finished with Orange Anodizing looks fantastic. Contact Us to have our design technicians create a custom set of gauges for your specialized applications.